We are treated to an Istanbul derby in this second game of the double-header for these teams and there is a lot at stake in this game. The hosts will be happy with their 2-1 start to the campaign but the away team are one of only two sides who have a 0-3 record at this stage of the season. Anadolu will be desperate for a win but in a local derby, there is no guarantee of getting what you want, so it could be a very long night for Anadolu fans. Going to the Ukraine and grabbing a 7 point victory over UNICS Kazan was a tremendous result for Darussafaka and they’ll be keen to capitalise on this win. They may feel tired after travelling back from this game, something that doesn’t apply to their opponents, but the joy and excitement of a big away win is likely to offset any signs of fatigue and weariness in the home side on Thursday night. There is absolutely no shame in losing at home to CSKA Moscow, so the Tuesday night reversal for Anadolu shouldn’t hit them too hard. However, there is no doubt that a home loss that brings about your 0-3 record at the start of the campaign is going to be a sore one to take. With a local derby, Anadolu don’t have the travel concerns that many teams are experiencing this week, and this means the away team will fancy their chance sof getting something from this game. Derbies can be difficult to call as passion takes over. With it being a derby match, it is always likely to be a close-run thing and the travelling may impact on the hosts after their big efforts in the Ukraine on Tuesday. 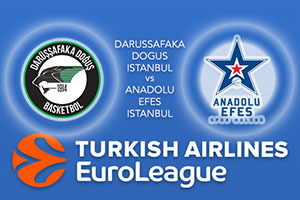 However, there is still a lot to like about the hosts going into this game and you can take Darussafaka Dogus Istanbul at -3.5, which is provided at odds of 1.90. If you’re looking for the Over/Under market, look to go UNDER 158.5 which is available at odds of 1.90. Bet Now!